North to Cree Lake, by A. L. Karras (pub by Trident Press, New York, 1970, 255pp.) Illus. by Laszlo Kubinyi. North to Cree Lake records true accounts of experiences in a land “where no tin cans, or bottles, or paper, or other man-made litter was to be found,” and no “influx of tourists, or developers, or promoters, or sportsmen, or despoilers” had yet arrived. From 1932 through the winter of 1939, the author and his brother, Ab, moved into Northern Saskatchewan to live where the Depression had little effect. They built several cabins, survived minus 70-degree temperatures, and lived off the land. They decided they could get what few supplies they needed by trapping, but they knew nothing about trapping. It was hoped that they could learn from experienced trappers, but they soon found that the men who knew the trade had no intentions of sharing their knowledge. Knowledge came through many trials and a lot of errors. We have inherited a Hollywood-induced picture of the wilderness winter, but through the author’s experiences, you get to share a lifestyle that had certainly changed little since Lewis and Clark. On the morning that the temperature dove 100-degrees below freezing, Karras described standing outside the cabin. When he exhaled, the moisture in his breath instantly froze in the air, creating a sound like a sheet of paper being slowly torn. You will find yourself being led on winter trapping trails, across frozen lakes, following caribou herds that had packed snow so hard that feet of snow could be traversed without the need of snowshoes. His accounts of wildlife encountered while walking the trap-lines gives great insight into the habits of wolves, deer, caribou, fox, bear, and others. As they build and use a dogsled team, you learn in detail what that entails. 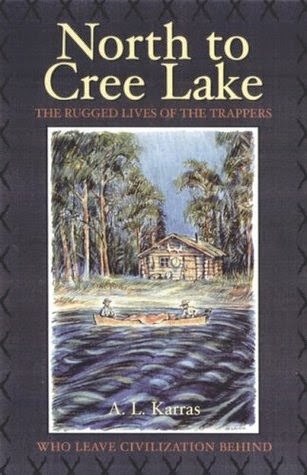 If you have read and enjoy books by Grey Fox, another wilderness writer, you’ll enjoy this book.